Then the Lord said to him, “Not so! Whoever kills Cain will suffer a sevenfold vengeance.” And the Lord put a mark on Cain, so that no one who came upon him would kill him. Then Cain went away from the presence of the Lord, and settled in the land of Nod, east of Eden. This reading describes Cain, who has brutally murdered his brother. This is a crime against not only his brother but also God’s holy plan for a world grounded in peace and love. Cain must be removed, and justice must be restored. However, God’s justice is not vindictive; it is justice tempered by mercy. The upper trigram is Christ, the light of the world. 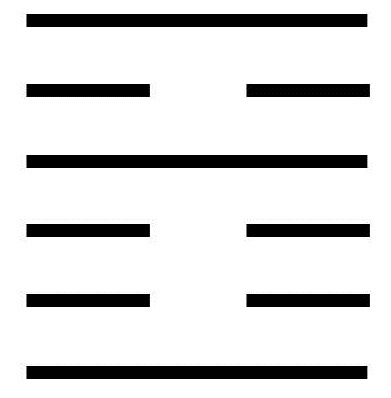 The lower trigram is Word, whose image is Thunder. Thunder represents the fear of attribution, of justice. Society must be based on justice. Justice must always be guided by Wisdom. To look to the law for protection against criminals and liars. To promptly take the necessary steps to protect oneself and others from injury. To find a middle ground between cruelty and softness. To ensure the laws are clear, the penalties fair, and the corrections swift. To take vigorous measures to break through obstructions. A moving line in the bottom position reminds us we are not punishing for the sake of punishment or humiliation, but to bring about a correction. Therefore, the first transgressions should be met with a mild response. A moving line in the second position describes a situation in which one can easily discriminate between right and wrong but may be overcome by anger. Anger blots out Wisdom, and under anger’s influence, it is easy to get carried away in the punishment. The line suggests that even if this has happened, the punishment is justified, and no great harm has been done. A moving line in the third position suggests that the punishment is being carried out by someone who lacks the necessary authority. This makes a correction unlikely. The evil that has been done has a long history, and dealing with it is difficult. The punishment is likely to arouse great resentment. The enforcer should be reassured by knowing that the punishment was necessary and the outcome inevitable. A moving line in the fourth position suggests that the obstacles that must be overcome are very large. Powerful opponents need to be punished. This is difficult; the effort will succeed only if undertaken by one who is both tough and honest. If one understands the difficulty and follows through, success will eventually be achieved. A moving line in the fifth position tells us the case at hand is difficult, but what needs to be done is clear. There is a natural inclination to leniency. A good decision in this case requires impartiality and an awareness of the great responsibility one has undertaken. One must also be careful, because with the responsibility comes danger. A moving line in the top position is the opposite of a moving line in the bottom place. A moving line in the first position describes a first-time offender who can still be corrected. A moving line in the top position describes a longtime offender who is hardened and unwilling to repent. Correction is therefore impossible, and failure is likely. There is little hope in this situation.